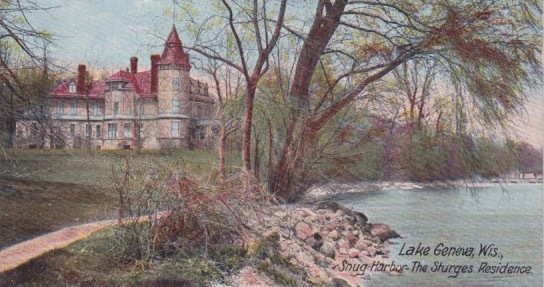 Snug Harbor is the next stop on our tour of 19th Century homes that graced the shores of Geneva Lake in southeastern Wisconsin. Antique postcard depicting Sung Harbor from my collection. village of Lake Geneva (then known as Geneva) and staying with their large family in a simple rooming house on Main Street. The first thing they thought of after the fire destroyed their Chicago home and the bank George and his brothers owned, was to escape to Wisconsin. They crowded into the small frame house on Main Street with another displaced family. Eventually, George bought the house and its five adjoining lots. The other family moved on, but the Sturgeses stayed in the small house while George planned and constructed a large mansion in the style known as French Chateau. Construction was finally completed in 1881 and the large family moved in. 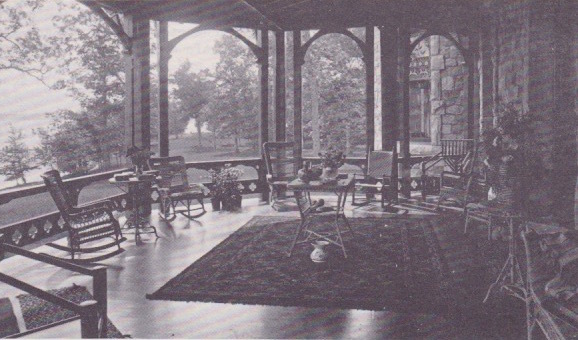 The lower level was constructed of thick rock, and a 5-story high tower provided a unique circular alcoves adjoining the parlor and master bedroom. To make the home's very large rooms seem not so big, the family purchased custom made extra large furniture. The home contained 20 main rooms in addition to enough bedrooms for their eight children. 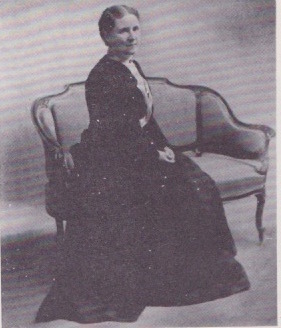 Mary Delafield Sturges and the children spent most of their time at the lake house while the city of Chicago continued to grow. The Sturgeses presented many gifts to the community of Lake Geneva and were highly respected. George sold the property in 1919, and it passed through several owners until in 1947, the estate was purchased by the Covenant Church and the grounds became known at Covenant Harbor Bible Camp. The mansion was used to house large church groups until fire claimed the beautiful old home in 1957. Today, the property is still known as Covenant Harbor and is used as a church camp and retreat center. In the past, I attended several singles ministry retreats in a modern building that sits on the main road leading into the grounds. stipulated that the land be used forever as a public library and public park. And a beautiful park remains there today. 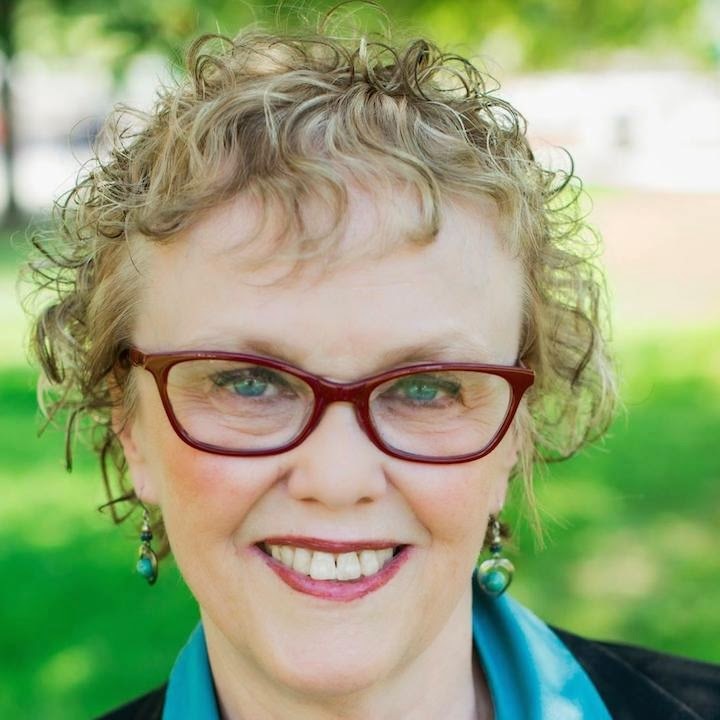 I’ve heard that Mary wanted to be sure that those people in town who couldn’t afford a lakeshore home would still be able to see the beautiful lake. The small frame house was the town’s public library until 1953, when the old structure became unsafe for public use. It was abolished, and a beautiful prairie-style building with huge window walls that seem to bring the lake inside was built. Mary’s legacy lives on through local resident, Chris Brook’s interpretive depiction of her. Chris dresses in the style of Mary’s times and entertains and educates with facts about Mary’s unique life—far too many to share here. Next month I’ll bring you a snapshot of another of the many mansions of Geneva Lake. Wow what an interesting story. I love to read histories like this! Hi Sharon. I'm actually the great, great grand daughter of George and Mary Sturges! Although I was born and raised in California, I lived in Kenosha for awhile. When my mother would come visit from San Diego, we would go to Lake Geneva to the old property and she would fondly remember the days spent as a young child playing at Snug Harbor's boat house and at their home on Dummer Hill. I wish I could've seen Snug Harbor before we lost it to the fire. It must've been spectacular! Thank you for preserving the history of such a grand era gone by - such rich traditions of Lake Geneva.